Chicago is one of those cities that is alive and full of life. Sure we can become a little shut in during a month or two in the dead of winter, but when a holiday comes around, or the slightest hint of spring shows - this city comes alive! And being that it's almost St Patrick's Day and we saw temperatures climb as high as 40 degrees...this is one city that does not mess around when it comes to celebrations, and St Patty's Day is no different- well lets just say we started celebrating weeks ago! It started with the South Side Parade. This annual event appears to be attended mainly by thousands of 20-something Northsiders who are all bussed down in yellow school buses (loaded with beer of course). 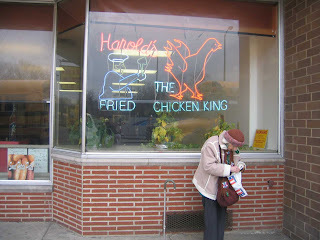 Keep in mind these Northsiders would generally never dream of heading into this part of town any other day of the year. This area reminded me of a real small town, especially with the John Deere trackers in the parade. It was a fun way to spend a day and see new parts of the city, but Dave and I decided we may just be a bit too old for this event. Glad we experienced it once though! Fast forward a week to the dying of the river and the main Chicago Parade. Now add in our friends from Seattle, and a few from Denver and we've got a daunting weekend on our hands! I don't know why the river gets died green; seems to me that it has a 'green hue' year round, but I still love to watch this process. Last year we were on the wrong bridge and didn't really see anything. We learned, and this year we made our way to the pe rfect location! We also spent a few hours at Lizzie McNeils. 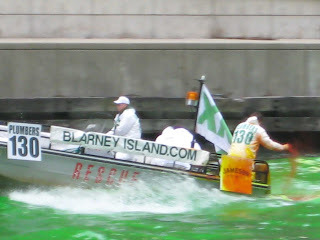 Us and about 1,000 other people all dressed in green, until they ran out of beer. Yup, ran out of beer. Workers were hauling in cases of warm beer as fast as they could. We saw three bars run out of beer before 5pm and I'm sure there were m any more. 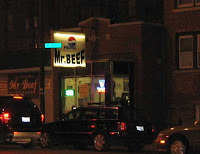 A visit with a beagle, a chat with a gorilla, 24 ounces of Guinness and Mr Beef to top it off (the original Mr Beef on Orleans. All in all it was a good 15 hours. Monday morning I weighed in at a healthy 7 pounds heavier - ouch. It's going to be a long week of working out and detoxing but it was worth it. 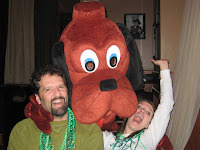 After all, it was St Patty's weekend in Chicago - and we were fat and happy.